In late 1915, in Berlin, Albert Einstein announced the general theory of relativity: his greatest achievement. In 1931-33, he lectured on relativity in Oxford, receiving an honorary degree from the university and staying in rooms in Christ Church, before fleeing his home in Nazi Germany and settling in Princeton. How much is known about Einstein’s time in the city of dreaming spires? For the centenary of general relativity, Einstein biographer Andrew Robinson will give a talk on “Einstein in Oxford” at Christ Church, Oxford on December 3. Robinson, the author of Einstein: A Hundred Years of Relativity, will reflect on relativity, Einstein’s intriguing relationship with Oxford and the puzzle of his universal fame. My father was a physicist at Oxford’s Clarendon Laboratory for more than four decades, revered Einstein’s work and wrote a textbook on relativity. I was born, brought up and largely educated in Oxford. So I am naturally curious about Einstein’s relationship with the city. Nothing further came of this Oxford visit for a decade. But the name of Einstein’s host in Oxford in 1921, the physicist Frederick Lindemann, proved to be very important. Though born in Germany in 1886, Lindemann was actually brought up in Britain and regarded himself as British. But he returned to Germany as a PhD student in Berlin. In 1911, when his Berlin supervisor, the future Nobel laureate Walther Nernst, organized a key scientific conference in Brussels—the first Solvay Congress—Nernst appointed his student Lindemann as one of the scientific secretaries of the conference. And it was at this historic conference—where the young Einstein lectured on quantum theory—that Lindemann first met him. In 1919, Lindemann was elected Dr Lee’s professor of experimental philosophy (that is, physics) in Oxford, and began the much-needed rejuvenation of physics at the university, centred on the Clarendon Laboratory. The Dr Lee’s chair was attached to Wadham College, where Lindemann remained a fellow until his retirement. But in 1921 Lindemann was also elected, as was legally possible in those days, to a “studentship not on the governing body” at Christ Church, which had provided the endowment for the chair. This entitled Lindemann to rooms in Christ Church that were more spacious than Wadham could provide, and from 1922 for the rest of his life, until his death in 1957, ‘Prof’, as Lindemann was known, lived in Christ Church. He was living there when he became close to Winston Churchill in the mid-1920s and eventually acted as Churchill’s key scientific adviser during the Second World War. He can of course have as many meals as he likes alone in his rooms and I will endeavour to preserve him as much as possible from importunate invitations. I am taking steps to see that he can get some sailing, so that I hope he will not feel that he is wasting his time here altogether. His first Rhodes lecture was on 9 May. Entitled “The Theory of Relativity”, it drew a packed house in the Milner Hall of Rhodes House, with some people standing. But since the lecture included much mathematics and was also in German, it quickly went over the heads of most of the audience. Those whose maths was good enough to follow Einstein’s calculations, mostly lacked sufficient German to follow his words, while the German speakers certainly lacked sufficient maths. Once more he had an audience which, though not so large as for his first lecture, almost filled the hall. An analysis of the audience was interesting. Senior and junior members of the University were divided by a barrier. The senior members consisted chiefly of teachers in the faculties of Literae Humaniores, mathematics, natural science, and theology, all of whom are affected in some degree by the new theory. The junior members were drawn by considerations partly of science, partly of language, and partly of curiosity. The element of curiosity, however, was not so strong as for the previous lecture, and most of those present had a serious interest.… Two blackboards, plentifully sprinkled beforehand in the international language of mathematical symbol, served him for reference. 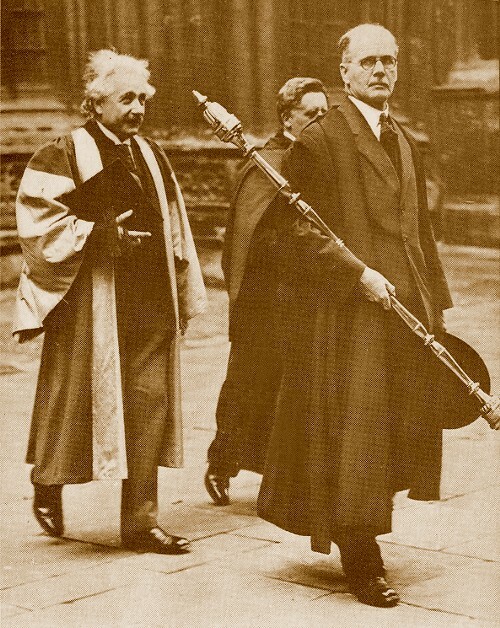 Just before the third lecture on 23 May, Einstein was awarded an honorary doctorate by the University at the Sheldonian Theatre. The Public Orator, presenting Einstein to the vice-chancellor in Latin, claimed that relativity, “which touched both science and philosophy, was specially acceptable to Oxonians … who had learnt from Heraclitus that you could not bathe in the same river twice”. Conclusions obtained by purely rational processes are, so far as Reality is concerned, entirely empty. It was because he recognized this, and especially because he impressed it upon the scientific world, that Galileo became the father of modern physics and in fact of the whole of modern natural science. It is my conviction that purely mathematical construction enables us to discover the concepts and the laws connecting them which give us the key to the understanding of the phenomena of Nature. Experience can of course guide us in our choice of serviceable mathematical concepts; it cannot possibly be the source from which they are derived; experience of course remains the sole criterion of the serviceability of a mathematical construction for physics, but the truly creative principle resides in mathematics. In a certain sense, therefore, I hold it to be true that pure thought is competent to comprehend the real, as the ancients dreamed. With his pipe and piano playing? Why should this barbarian roam? Could he not have stopped at home? divided his time between his mathematics and playing the violin; as one crossed the quad, one was privileged to hear the strains coming from his rooms. In our Governing Body I sat next to him; we had a green baize table-cloth; under cover of this he held a wad of paper on his knee, and I observed that all through our meetings his pencil was in incessant progress, covering sheet after sheet with equations. Andrew Robinson will give a talk on “Einstein in Oxford” at Christ Church, Oxford on 3 December 2015. He is the author of Einstein: A Hundred Years of Relativity, published by Princeton University Press in 2015, and Genius: A Very Short Introduction, published by Oxford University Press in 2011.